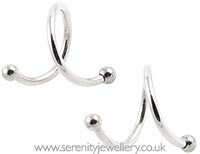 Hypoallergenic 316L surgical steel body spirals with 8mm internal diameter. The spirals are secured at each end by 2mm screw-on balls. 1mm or 1.2mm gauge body spirals? 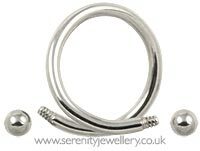 1mm/18 gauge spirals are good if your piercings have shrunk or were originally pierced with a smaller size. They are not compatible with the screw-on accessories which are 1.2mm gauge. 1.2mm/16 gauge is the most common size ears are initially pierced with. 1.2mm gauge body spirals are compatible with a large range of screw-on accessories and spares. 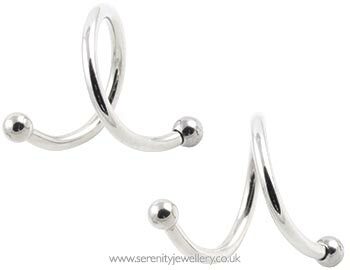 I love this spiral, however, getting the ball on the end to do it up once it's on your ear is really fiddly. I wore it once and now regret taking it off because I haven't been able to do it up again. 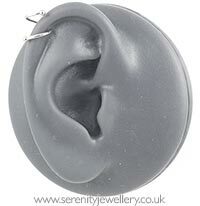 It does look great when its on- I wore at the top of my ear. It's not great for sleeping in though.